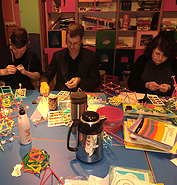 Nordic4DFrame can organize training workshops for teachers in the use of this exciting educational material. This training can take place at a nearby Science Centre, or at the school where they teach. In order to best fit the needs of the school and its teachers who will be using the 4DFrame materials, you have the options of purchasing a 4DFrame Large, or Regular, activity box by itself, with specialized group instruction given by a 4DFrame-trained teacher, or you can even opt for having separate training after you have had the opportunity to work with the materials on your own. 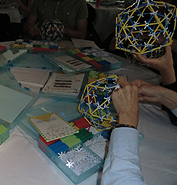 Teacher Training Package: 10 teachers, 10 pre-packaged boxes of 4DFrame materials with 6- 10 hours of hands-on training. 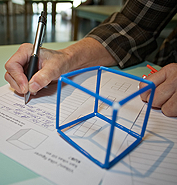 Besides Teacher Training we also encourage classes to visit science centres already involved with 4DFrame so that students and teachers become familiar with the art, math and science of using this educational material together. "Inspiring and well planned morning. Feels fun and exciting to try this to see how they might work for our students. Feels like we can make use of this in our theme, picture and math work. I look forward to continuing. A credit to you both for your dedication; it's infectious." "Good to get your own bag of materials. Good and inspiring to try to build yourself. Has become more interesting now." "Hard to say what will happen with our students. It's certainly worth a try. Good to try it out before we begin with the students." "Good material. Funny, inspiring for our students, practicing their fine motor skills. Fun to try so ourselves. Think about how we work with a little yellow perhaps? Good tip with the picture, mix materials with things torn out from magazines. Fun with soap bubbles." "Fun and inspiring. Received many tips and hope we can have contact in the future so that I can develop myself and work with this material. Thank you for allowing me to be a part of it." "It's been a good morning. The material seems very exciting. Too bad there were so few in our group representing elementary schools, but we'll show it off during the year! Thank you." "Fun to try something new! Good materials, many opportunities to develop this further... Thanks for an inspiring day!" "Good thing that we got to try all the material before students will work with it. Good to get information and an overview on how to continue with 4DFrame." "It's fun and a good material. Something one can use in many different ways and areas of work. It's great that you can try and get a different feel for the material and ideas for how to work with your students." "Great fun! Educational to think in some new ways. One can imagine many different areas of work." Thanks for these two days that gave us so much! I've talked to the students and they have only positive experiences from the visit. Everyone was very supportive of your presentation of the Science Center and Teknorama as well as the showing off of the museum. Everyone was also the presentation of 4Dframe, the Korean material. One would like to work more with this Korean materials. Next time we can take pictures of the students' designs as documentation. The crowns, towers and space shuttles as well as different patterns were fabulous! It has been very good not only from the mathematical side, but also to strengthen students' self-confidence and give them new ideas. Many would like to try using the material with students at their next student teaching that has been given wk 17 to wk 21. I hope that the current teacher candidates will use the material in their future work when it is available. We here at Södertörn University would like to use it to work on our seminars - practical laboratories. Please add us to the waiting list.